The prophet Isaiah (52:13-53:12) was read, reminding us that Israel had long been waiting for this servant of God to come and bring deliverance and forgiveness of sins. I was grateful to be given the opportunity to preach the Good Friday homily. I spoke on Jesus’ choice to restrain himself in order to be obedient to his Father’s will. His obedience in going to the tree of Golgotha undid the destruction caused by the disobedience of the first humans who went to the tree in Eden and ate of its fruit. When I spoke of Jesus taking all of the the sin and wickedness, disobedience, suffering, and sorrow of the world into and onto himself, I was unexpectedly moved emotionally – even to tears. It was the first time that’s ever happened when I’ve preached. As I’ve processed that experience, I’m still not exactly certain what happened. The Spirit kindled something deep within me that I had not planned and was not expecting. I was simultaneously overcome with the reality of the brokenness of this world and Christ’s suffering for it. Looking out over the faces of the congregation, knowing their stories, their struggles and their griefs, it was as if I glimpsed the devastating extent of the Fall. Internally, I was also aware of the damaging effects of sin in my life and the life of my family. In that moment, I was awakened unexpectedly to our desperate need for a Savior. Give tears then: give the grace of tears. Give me, Lord, this great grace. Tears such as Thou didst give to David, to Jeremiah, to Peter, and to Mary Magdalene. We finished the service with The Solemn Collects, the veneration of the cross, and a magnificent rendition of Bach’s passion story according to St. Matthew by Beth Linnartz, Ehsan Samei, and Todd Granger (Aus Liebe Will Mein Heiland Sterben). Again, what a feast of feasts, these days are! And it’s not over yet! Tonight a number of us from Holy Trinity will gather for the The Great Vigil. Then tomorrow, we will sing, “Christ the Lord is risen today,” with our brothers and sisters at All Saints. I confess, I am greatly looking forward to the end of Lent. It has been a long and challenging one in many respects. Not just for me but for those whom I love. I agree with Tom Wright, after such a long Lent, we need more than one day to celebrate the magnitude of the resurrection. “We need days of morning prayers and champagne,” to rightly linger in the joy of this celebration! Its fullness, depth and height. One Father of us all. As God in Christ forgave. And Christ shall give you life. We’ve been talking about Lent at Holy Trinity and at All Saints and will continue to do so. As Lent is new to many of us, I thought it might be helpful to offer some thoughts or quotes on Lent to help fill in some blanks or offer some various perspectives on this season. 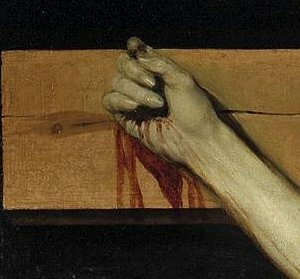 The purpose of the first part of Lent is to bring us to compunction. “Compunction” is etymologically related to the verb “to puncture” and suggests the deflation of our inflated egos, a challenge to any self-deceit about the quality of our lives as disciples of Christ. By hitting us again and again with demands which we not only fail to obey, but which we come to recognize as being quite beyond us, the gospel passages are meant to trouble us, to confront our illusions about ourselves. “Remember, you are dust…” From this perspective, Lenten penance may be more effective if we fail in our resolutions than if we succeed, for it’s purpose is not to confirm us in our virtue but to bring home to us our radical need for salvation. In the Eastern Church, today is the feast day of St. Aristobulus, known as the first bishop of Britain. He is credited with preaching the Gospel throughout the Celtic regions of Spain and the British Isles. While much of this story remains veiled in the mist and mystery of the past, it is interesting to consider how those who were a part of the earliest communities that followed Christ went to great lengths to see that his message of Good News spread throughout the world. For more on Aristobulus, there’s a nice summary posted over at The Anglo-Catholic. This morning’s Gospel reading is taken from Matthew’s account of Jesus in the wilderness being tempted by Satan. There is much to gather from this account. I’ve preached this passage a couple of times. God’s word is alive and the Spirit guides us as we read it. This morning what has struck me upon sitting in this text again is the reality that temptation, when it comes is not limited to the areas we’d most suspect but it invades to pervert and distort even the good creation (“turn these stones into bread”), the holy place (“leap from the temple pinnacle”), and worship itself (“all these I will give you if you will fall down and worship me”). The common association of temptation with the Seven Deadly Sins has its place, for those sins are indeed deadly. But the real essence of temptation attacks where humans expect the best: daily bread, sacred spaces, the devotion of the heart. 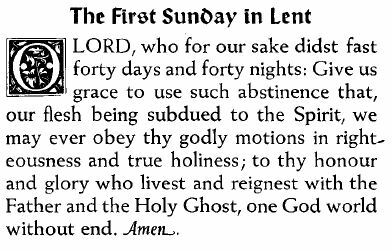 God, you cleanse your church with the annual observance of Lent: grant your family that what they strive to obtain from you by fasting the may follow up with good works. Thomas Cranmer wrote the following collect primarily to avoid the Pelagian themes of the old Sarum prayer and to point to the Gospel lessons. This prayer is based on one written by William Bright in Ancient Collects. The theme of the temptation of Christ in the wilderness relates to the Gospel reading in each of the three lections used for the first Sunday in Lent. “Then Jesus was led up by the Spirit into the wilderness to be tempted by the devil” (Matthew 4:1-3). Had Jesus given into one temptation, he would have failed comprehensively. But he didn’t! What about you? When was the last time you were tempted? When was the last time you were really, sincerely deeply tempted to sin? To say or do exactly what you know you shouldn’t say or do? What was it? What was the bait? Was it something new? Something old? Something habitual? How did it go? Did you resist? Or did you take the bait? The Devil tempts us to deny our identity in Christ; to deaden our desires for God, to sew seeds of doubt in God’s goodness and to diminish our dependence on Him. And if you do fall into sin, he loves nothing more than to whisper in your ear that you are disqualified from receiving the promises and love of God. Whatever sins you are wrestling with at the moment, turn from them and look to Christ. Only he is victorious BUT we get to share in his victory. Because Jesus is the only one who has ever beaten the Devil, and because Christ is with us, we need not be afraid of him. So ask Christ to be with you in the deserts of your temptation. Also, invite others in. Bring what is in the dark out into the light. For if many died through one man’s trespass (Adam), much more have the grace of God and the free gift by the grace of that one man Jesus Christ abounded for many. And the free gift is not like the result of that one man’s sin. For the judgment following one trespass brought condemnation, but the free gift following many trespasses brought justification. For if, because of one man’s trespass, death reigned through that one man, much more will those who receive the abundance of grace and the free gift of righteousness reign in life through the one man Jesus Christ. (Hatchett’s Commentary on the American Prayer Book provided background information on collect).